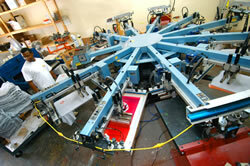 Have an idea for Screen Printing? We have an In-House Graphics Department that can help bring your ideas to life. Or we can use your own design. If you do not have any art, there will be a minimum $40.00 art charge to create vector art for you. We will need a sketch, or sample from you to work off. Shipping Fees are based on weight and zip code. We use UPS rates, and then add $3.50 for handling. Please indicate to us if we are shipping to a business or a residence.